Bankruptcy is basically a process you enter into when you cannot pay your debts, often allowing you to start afresh. When you file for bankruptcy, some of your debts will be discharged, while others will be reorganized. Both individuals and businesses may file for bankruptcy, and in both instances, a bankruptcy lawyer or one knowledgeable in small business law respectively, or both, will be necessary to help steer the affected individual or business in the right direction. Normally, creditors are compensated fairly. This process does not need to be a nightmare, but you do need to meet certain requirements. There are two types of assets; these are exempt and non-exempt. Exempt assets are those assets that do not need to be used in paying off debts, i.e. creditors cannot take them. Examples include: part equity in a home or vehicle, clothes, and other personal items. These assets do not include jewelry and expensive toys like a jet ski. Following this, the court will assign a “trustee” who will use your non-exempt assets to pay off the debts. Similar to exempt and non-exempt assets, there are also two types of debts; these are secured debts and unsecured debts. A secured debt is described as a security interest; it is normally an asset bought on credit from a creditor. This type of debt takes priority over non-secured debt. If secured debt cannot be paid off, a creditor can repossess the asset and sell it to defray costs; a shortfall of debt thereafter is considered as unsecured now. It hasn’t disappeared, just changed its form. At this time, the courts issue an “automatic stay” to protect you from further action by creditors, which allows one to avoid future foreclosures or repossessions and protection from litigation. This is the liquidation of assets and where one is only allowed to keep those assets that are exempt. Non-exempt assets are auctioned and sold to whoever places the highest bid. Money made at the auction pays any outstanding debts. Debts that cannot be repaid are discharged. However, some types of debts cannot be discharged; these include student loans, taxes and child support. In the case of student loans for example, wage garnishments from defaulted student loans are a burden that can follow and haunt you for a long time after you have finished studying. A burden that if not properly and quickly managed can easily lead to a bankruptcy filing. This means that one is attempting to regroup, recoup and get back on track. 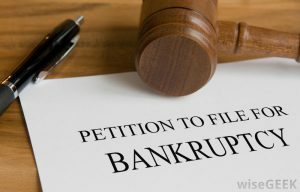 It is often referred to as “reorganization bankruptcy for individuals.” One files for Chapter 13 bankruptcy if one will repay debt over a 5-year period. However, there are conditions for being eligible for a Chapter 13 bankruptcy. One needs a source of income that is reliable and that will allow one to live and repay debt. One needs to have a set plan on how any debts will be repaid, amounts and timeframe thereof. Once bankruptcy is approved, both debtors and creditors have to accept the court’s order. This is often called businesses’ reorganization tool and it allows non-exempt property to be protected. It allows one to pay back debts in arrears and blocks foreclosures and repossessions. Finding the right bankruptcy lawyer is the very first important to do. This is because with their advice, you will have started the process and will allow you determine the appropriate course of action going forward. Anyone considering filing for bankruptcy protection would probably be stressed and feeling under pressure. Finding an experienced bankruptcy attorney is the one thing you can don to help take off some of that pressure off your shoulder. Deciding to file for bankruptcy takes courage and the obvious route is to try to work it out on your own, which is harder and lonelier, and not advisable. However, if one insists on doing it without an attorney, one should answer the following questions and if more than two describe you then you should definitely consult with a bankruptcy professional. Are people giving you threatening phone calls about debts? Are you paying the minimum possible payment on credit cards? Are you taking payday loans? Are you asking loans from family and friends? Are you behind on tax payments? Are you about to lose your present job? Are you ill and unable to be present at your job? Are you gambling to make ends meet? Are you getting foreclosure notices? Are you in arrears for alimony or child support? The answers to these questions indicate that filing for bankruptcy is your best solution, but it would be best to consult an attorney first. If these thoughts are on your mind, then consulting a bankruptcy attorney is a good decision to make. While a bankruptcy can be a dark cloud over the next ten years, the good part is that you can start to rebuild yourself as soon as the case is closed. How Good is Your Present Credit Report? It is probably not good, but filing for bankruptcy may even improve your credit report as debts are eliminated. Creditors may view you as less of a credit risk now that you were bankrupt as you are not allowed to file for bankruptcy during the next six years. After about 2 years you could qualify for a home loan if you can make a down payment and have proof of income to service this debt. Car loans are available when existing debt is discharged. People will offer you credit immediately after your case closes. But one must remember to be careful as credit got one into trouble in the first place.